Despite the crazy weather we are dealing with (hot, rainy, cold, rainy, windy, rainy) it's time to start thinking about Christmas! 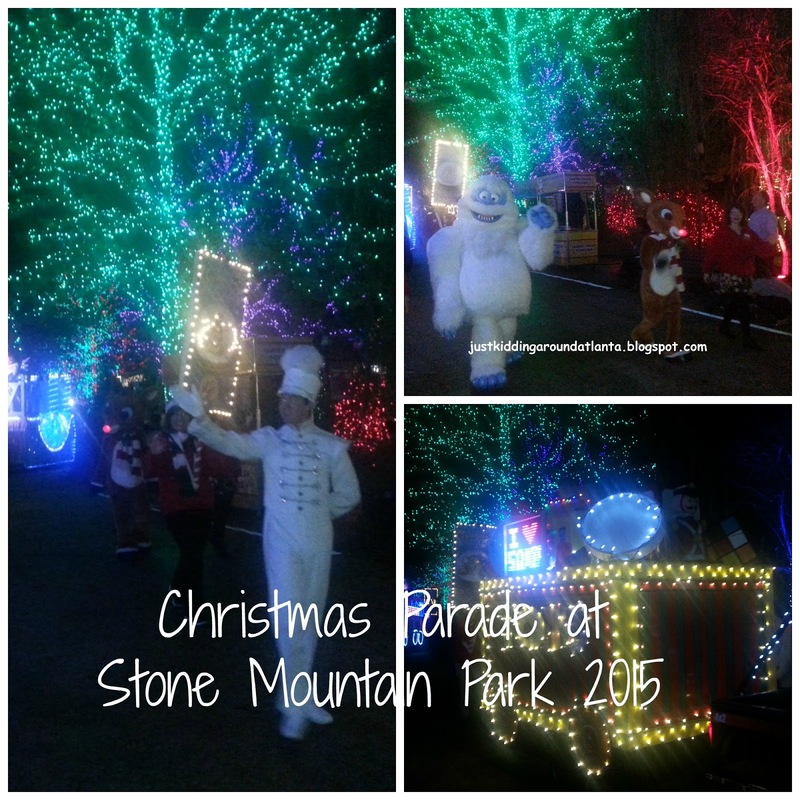 For my family, one way we usher in the holiday season is a visit to Stone Mountain Christmas at Stone Mountain Park. Everything there is designed to put you in the Christmas spirit! The lights are the first thing you'll see as you enter the gate. There are lovely snowflakes on light poles, Christmas lights on all the buildings, and don't forget to take a quick drive down Snowflake Lane. Everything is sparkling, merry and bright. And look up - you just might spy mistletoe, so keep your honey close by! 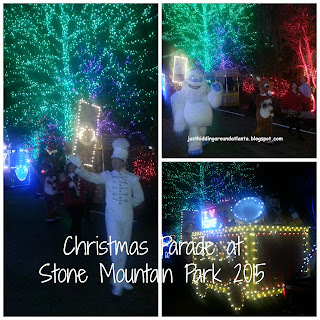 Stone Mountain Christmas is offered on select dates from November 7 - January 3. On those dates, check out the fun and festive Christmas Parade that delivers Santa & Mrs. Claus to Christmas Corner. You'll enjoy the performers from the shows, plus catch a glimpse of the beautiful Snow Angel! After the parade, we always head straight to the Singalong Christmas Train. It's a little different this year (no onscreen antics with elves - just lyrics for the songs playing). We enjoyed the selection of carols, including White Christmas, Walking in a Winter Wonderland, and other family favorites. And if you like seeing the performance of "The Gift" midway through the ride, you will really love it this year. This year was my favorite performance of all the years we've attended - really beautiful and heartwarming. 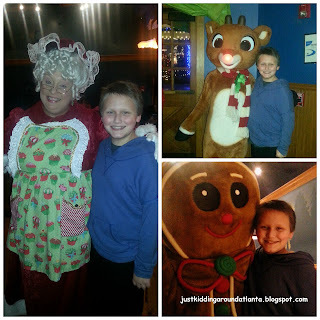 After a fun train ride around the Mountain, we usually visit Santa, do a little shopping, and check out the characters you might see in the park. Gingerbread Man, Rudolph, Bumble the Abominable Snow Monster, and even Mrs. Claus got a picture with David this year! We love watching the glassblower at work, and looking at his beautiful glassware in the store next door. You'll also find a fantastic toy store, candy store, and a few other gift stores to visit! You can also visit the Snow Angel, and decorate yummy cookies. Did you know Stone Mountain Park was named by USA Today as one of the ten best places in the country to catch Santa Claus?! 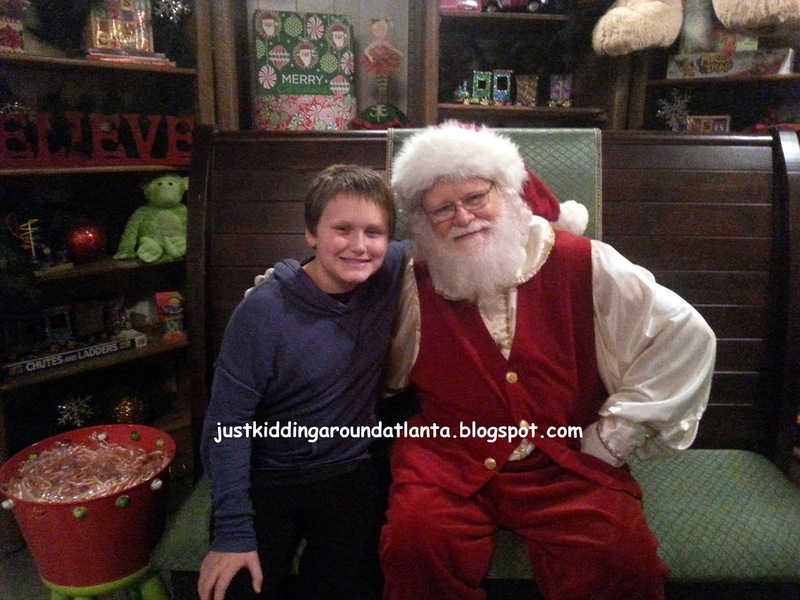 My son humored me and had a quick talk and then a picture with Santa. Time for the 4D movie - it's right across the walkway from Santa. This year SMP is offering Ice Age: A Mammoth Christmas. Can a handful of prehistoric misfits really save the holiday? Find out in this hilarious adventure featured in 3-D with added in-theater effects that will transport you back to the Ice Age. The shows being offered this year include A Christmas Carol, Forever Christmas, and Holly Jolly Cabaret. We especially enjoyed the Christmas Carol - David got such a kick out of it! The actors in all of the shows are great, and the music is festive. This year's new show is The Littlest Christmas Tree. It’s Christmas Eve and the smallest tree on the lot has been passed over and is feeling low. Good thing his new friends Betty the Bunny, Sammy the Skunk and Nutty the Squirrel are there to help him see his inner worth! The tale of The Littlest Christmas Tree is sure to be a new, family favorite. The night ends with the lovely Snow Angel flying through the courtyard and her magical snowfall, plus a fireworks finale! If your kids can stay up til 9:45 it is truly worth staying for - a really beautiful ending to a fantastic night with your family! And finally - the food! I must share that The Campfire Grill has some seriously good comfort food ready for you. 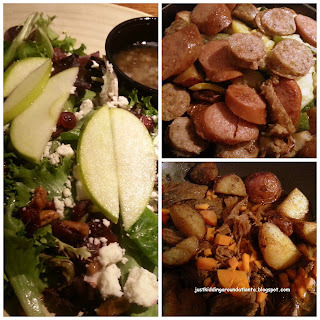 We tried the Sausage Skillet, Pot Roast with veggies, Chicken Tenders, (they also have Fried Chicken) and a huge Cranberry Apple Salad. Sides were mac-n-cheese, baked beans and mashed potatoes with gravy. Plus they throw their delicious yeast rolls to you! It was all awesome, but David's favorites were the chicken and mac-n-cheese. Mine were the yummy, tangy salad plus the pot roast and the baked beans. I wish I'd remembered to get a picture of the yummy dessert they sent home with us. Stone Mountain's new buttery, delicious cinnamon bread is to die for! Make sure to pick up a loaf while you are there - it's warm, gooey and oh so good! Disclosure: Stone Mountain Park provided our family with a night at Stone Mountain Christmas, and they will provide the tickets for my winner. No other compensation was received, and all opinions included here are my own! Long ago when my older boys were young, we would go to Stone Mountain. Christmas was amazing back then. So pretty, so cold, but you got the Christmas fever in you right away when you stepped into the park. We just love spending time together as a family. Sometimes I wish we had an old fashioned Christmas the way Stone Mountain feels sometimes. My favorite Christmas tradition is having the kids sleep under the Christmas tree on Christmas Eve! I can't wait to take the boys this year. I have been waiting till Joey was old enough to to really enjoy it. Looks like so much fun! We always go out looking at Christmas lights around the holidays. It's a lot of fun. I want to see the Snow Angel flying through the courtyard..All the lights will be beautiful I'm sure. A few of our favorite Christmas traditions are going to the same Christmas tree farm each year and cutting down the perfect tree then bring it home to decorate while listening to Christmas songs and enjoying homemade cinnamon sugar donuts. We also love to drive around looking at Christmas lights while drinking hot chocolate on Christmas Eve night each year. We hang the ornaments up together the night after Thanksgiving. I can't wait to do this. Stone Mtn is the best. However, I have never been during the Christmas season.